LOS ANGELES, CA -- (MARKET WIRE) -- November 15, 2005 -- Find Bliss, the peaceful lifestyle company, has introduced an innovative new monthly e-zine, www.findbliss.com, offering in-depth, service-oriented articles, products and music to serve the growing LOHAS (lifestyles of health and sustainability) community. The estimated number of consumers is 63 million in the U.S., with estimated sales of more than $540 billion worldwide, according to research by the Natural Marketing Institute. This premier online magazine will bring exclusive new articles every month into an engaging and beautifully designed electronic environment. The Find Bliss e-zine has featured sections ranging from Aromatherapy, Spas, Yoga, Food, Home & Garden to Career, Money and Organic Style. "We developed the sections of the e-zine based on key areas of life that need to be balanced and aligned in order to experience sustained bliss," said Doug Corbett, founder of findbliss.com. Findbliss.com also sells holistic lifestyle products, including custom-blended, organic essential oils, motivational T-shirts from RubyLove, chakra necklaces from Energy Muse and Mantra Ties. For the chance to win a Mantra Tie, log onto www.findbliss.com. According to the Organic Consumer Association, 2005 sales of organic and natural products will top $45 billion, accounting for nearly 10 percent of all retail grocery sales across America. "Our goal is to find the most unique and environmentally friendly products for our readers. We realize that these types of products are an important part of their lifestyle and we wanted to make them easily accessible," said Corbett. Corbett, who has 20 years of experience in traditional magazine publishing, conceptualized the idea and attracted creative director, Justine Power. Power has brought the site to life and captured Corbett's vision for a complete magazine experience never accomplished before online. Power was senior designer at Gaiam International and played a key role in redesigning the Gaiam brand before starting her own firm. Kyle Roderick serves as managing editor of www.findbliss.com. The author of four books on health, fitness and style, she has also contributed articles to Vanity Fair, Conde Nast Traveler, InStyle, Elle, Allure, Natural Health and Spa magazine. The former health editor of www.thirdage.com, Roderick has also covered organic agriculture for the Los Angeles Times. 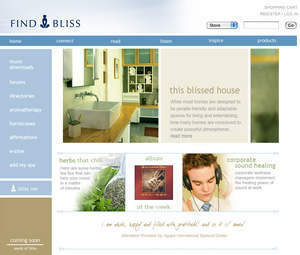 Findbliss.com includes many state-of-the art unique elements, including a compelling digital music download environment featuring New Age Music, Yoga Music and World Music. "We were interested in creating the premier digital download environment for this rapidly growing segment of conscious music consumers. It was also important to us to go with 100% download to reduce the consumption of plastic cases, paper for printed inserts, and fossil fuel to ship CDs," explained Corbett. The Find Bliss music store features music for yoga, relaxation and deep meditation. Some of the top-selling artists include Krishna Das, Donna De Lory, Dave Stringer and Jai Uttal. The company is developing compilations for the yoga, spa and mediation markets. "We feel strongly that personal and planetary goals need to be aligned and consistent. Reducing resources is a critical component of this lifestyle and vision for the Find Bliss site," Corbett commented. "The response to the Web site has been overwhelming and we believe that with a clear vision of the future, the possibilities of what our site can accomplish for readers and our sponsors are infinite and blissful." Beginning November 9, 2005, findbliss.com will give free Mantra Ties to the first 25 people that log on to register at www.findbliss.com. Mantra Ties retail for $35.00 to $45.00 each at Los Angeles' most fashionable boutiques. Los Angeles, Calif. based Find Bliss is an emerging community based magazine and online solution for people looking to get inspired, connect with others, listen to music, uncover dreams and breathe life into everyday experiences. They are bringing together people who are dedicated to finding balance, fulfillment, and peace of mind in an increasingly complex and challenging world. For more information, contact Doug Corbett at 310-306-1785 or doug@findbliss.com. Visit www.FindBliss.com, the new e-zine that covers<br>topics to help you live a blissful life.